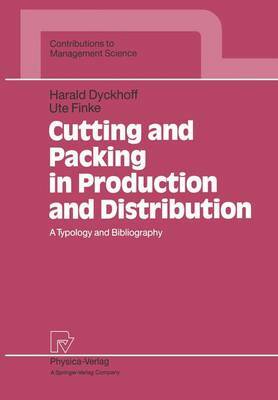 Cutting and packing problems such as the cutting of sheet metal and the loading of contain- ers or, in a more abstract sense, capital budgeting or assembly line balancing have been treated in scientific literature of various disciplines for about fifty years. Since the pioneer work of Kantorovich in 1939, which frrst appeared in the West in 1960, there has been a steadily growing number of contributions of increasing importance in this research area, particularly in the past decade. As of today more than 700 contributions exist even when applying a strict categorisation. Since comprehensive monographies and compiled studies are still lacking, it is very time consuming and thus expensive to search for a suitable solution procedure for concrete problems in the available literature. Thus, an apparently simpler way is often chosen, which is to develop ones own approach. For this reason there is not only the danger of unnecessary effort and scientific repetition, but it is reality. With the goal of improved research coordination an interdisciplinary Special Interest Group on Cutting and Packing (SICUP) was founded in 1988, which meets every two years (1988 Paris, 1990 Athens, 1992 San Francisco) and issues a semi-annual newsletter (SICUP- Bulletin) with up-to-date information. This book is intended to assist in the coordination of research work in this area.